Contained in both the Teacher Guide and Student Storybook are 16 lessons. Lessons for younger students frequently emphasize narrative drama, and physical representations of economics and personal finance concepts. Specific to grades K-2 are a variety of activities, including making coins out of salt dough or cookie dough; a song that teaches students about opportunity cost and decisions; and a game in which students learn the importance of savings. The Teacher Guide and Student Storybook for grades 3-5 contain 15 lessons. Lessons for elementary school students emphasize narrative drama, and physical representations of economics and personal finance concepts. Specific to grades 3-5 are a variety of activities, including a guessing game using clues to identify various occupations; the story Urban Mouse and Rural Mouse which teaches students about entrepreneurs and opportunity recognition; and a role-playing activity in which students learn which method of payment is appropriate in a variety of situations. 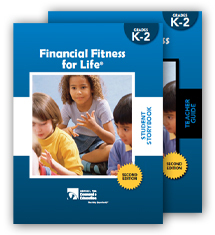 In the grades 6-8 Teacher Guide and Student Workbook there are 17 lessons. Lessons for older students illustrate certain uses of more abstract representations. Specific to grades 6-8 are a variety of activities, including developing criteria that students think would make a good graham cracker and taste-testing to determine which graham cracker meets their needs; deciding which activities are better suited to careers or hobbies; and learning how important planning is to the success of any goal or event. 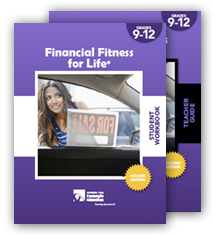 The grades 9-12 Teacher Guide and Student Workbook contain 22 lessons. Lessons for older students illustrate certain uses of more abstract representations. 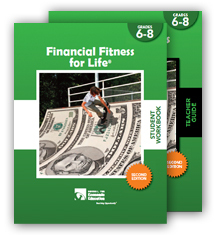 Specific to grades 9-12 are a variety of activities, including The Millionaire Game, which teaches students about the characteristics of millionaires; a budgeting exercise that shows students the importance of savings; and a chapter on finding the best deal on an auto loan. Research shows that students learn a considerable amount of their economic decision making outside of the classroom. Therefore, a key ingredient for any child's successful learning is the involvement of caring adults in their education. 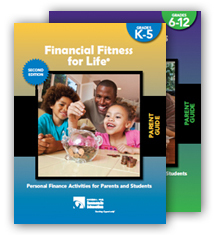 These Parent Guides contain fun activities that parents and children can do together to enhance learning personal financial principles and skills. 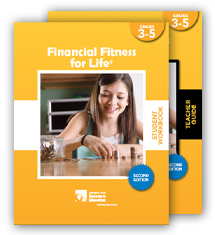 The Parent Guides link to the content contained in the FFFL Teacher Guide and Student Workbook at the same grade level, and are a valuable out-of-classroom enhancement to the lessons students are learning during the school day.